Your new life in California is waiting for you. Now it’s time to get ready! Moving 2850 miles, from one coast of the continental US to the other, involves careful planning, organization, and effort. No doubt you’re excited about moving to California, but probably also feeling overwhelmed at the thought of what it takes to pull off a cross-country move. Finding an interstate moving company you can trust with your belongings is one of the most critical first steps in getting ready for your move. We’ll provide you with up to four moving quotes from respected, licensed, and insured cross-country movers so you can start getting prepared for all the excellent opportunities you’ll have in California. Imagine exploring rugged mountains, gold-country foothills, verdant wine country, wild deserts, coastal redwood forests, and magnificent beaches. In California, you can choose to live in some of the largest metropolitan areas of the US – think San Diego, Los Angeles, and San Jose – or you can go with suburban or rural living options. It’s all up to you – the lifestyle you’re looking for plus the type of work you’ll be doing will determine where you’ll set up your California nest. As a New Jerseyan, you’ve been sharing your state with over 9 million residents in the fourth smallest state by land mass (8,721 square miles) in the country. Those numbers add up to about 1,195 people per square mile, making New Jersey the most densely populated state in the country – and the only state in the US where each county is designated “urban” by the US Census Bureau. By contrast, California’s population, at 40,017,007, is three times more than New Jersey’s and is the most populous state in the country. California covers 163,696 square miles – about 18 times the size of New Jersey. Both states do have a few things in common: As one of the leading industrial states in the country, New Jersey deals with high industrial toxins while California’s urban air quality is ranked worst in the nation, leaving both states at the bottom of the quality of life rating. USNews.com reports that New Jersey ranks 49th out of 50 states for quality of life and California ranks 50th. This report bases quality of life ratings on the condition of drinking water, air, pollution, social support, and the level of involvement of the state’s citizens in their communities. Both states share rich but contrasting histories. As one of the original 13 States, the Garden State has a deep colonial history. California didn’t achieve statehood until 1850. Its dramatic Spanish and Mexican history is alive in the names of cities, counties, streets, and subdivisions up and down the state, and is celebrated in many year-round festivals. New Jersey rates #2 in the nation for its quality of education and spends $18,402 per student while California ranks 25th, spending $11,495 per student. With California’s 82% high school graduation rate, the demand for higher education will remain strong. When crunching income and home price numbers, you’ll find the median home value is $328,200 in New Jersey, compared to $477,500 in California. The cost of living in both states is high. New Jersey’s cost of living ranks 41st of 50, while California ranks 49th of 50. However, the median household income in The Garden State is $76,475 – just over $10,000 a year more than California’s at $67,169. You’ll be hoping to find a good job while living in a state that has such a high cost of living. Fortunately, California offers extensive job opportunities. California has the #1 economy in the country and is the 5th largest economy in the world, while New Jersey’s economy is ranked 41st in the nation. Agriculture, science, information technology, trade, media, and tourism rank as the most popular Californian job sectors. Other strong industries are education, health, financial services, leisure and hospitality, manufacturing, and construction. You’ll find the most robust economic regions in the greater Los Angeles and San Francisco metropolitan areas. Mark Twain quipped, “The only difference between a tax man and a taxidermist is that the taxidermist leaves the skin.” According to wallethub.com, California’s tax rate is 12th in the country at 8.94% for state and local taxes while New Jersey rates 39th at 12.40% for state and local taxes. California residents pay almost 5% of their income toward sales and excise taxes and just 0.77% in real estate tax. In New Jersey, you’ve been paying 6.62% for sales tax and 1.89% in real estate tax. While New Jersey has a statewide mass transit system, Californians rely on their cars for commuting and recreation. San Francisco Bay area, Los Angeles Metropolitan region, and San Diego have rapid transportation systems, but those areas are also famous for their gridlocked freeways. California is a big state with lots to see and do so road trips can be delightful adventures. Amtrak runs up and down the coast from San Diego to Oakland, giving riders a chance to travel carless while enjoying some beautiful coastal scenery. Soon after you move to California, be sure to register your car with the Department of Motor Vehicles, obtain a California driver’s license, and buy auto insurance. You’ll appreciate California’s famous mild climate, and let’s face it – weather affects our daily lives. These climate comparisons will give you an idea of whether you’ll need a sweater in California or if you will need to bring your cozy layers: First, it only rains in the late fall and winter in California. In terms of climate, bestplaces.net scores Los Angeles 97.7% better than Princeton for comfort. About 48” of rain and 23” of snowfall per year in Princeton, while Los Angeles gets 17” of rain and no fluffy white stuff. The typical January high in Newark, New Jersey, is about 39° with lows of 25°. On an equivalent Los Angeles January day, you can expect a high of 68° with a low of 49°. An August day in Newark can reach an 86° high, with a low of 68°, and you can expect seven days of rain in the month. August highs in Los Angeles average 84° with lows of 66° and zero days of rain in the month. San Francisco’s climate is colder than Los Angeles’ with 27” of yearly rain, no snow, and an average August high of 66°. California’s natural beauty is legendary. With a spectacular 700-mile coastline and the rugged 400-mile long Sierra Nevada Mountain range, you’ll get a sense of California’s wild side by enjoying every kind of summer and winter sport imaginable. When you combine California’s great weather with endless opportunities for entertainment, sports, outdoor activities, world-class museums, famous amusement parks, unlimited dining options, wine and brewery tasting, and sightseeing, you’ll never run out of fun and exciting things to do. With a population of 142,650, Pasadena is a welcoming, family-friendly city northeast of Los Angeles. A highly educated workforce finds jobs in technical, engineering, education, pharmaceutical, and medical professions. Pasadena is home to the Jet Propulsion Laboratory, California Institute of Technology, Art Center College of Design, and Norton Simon Museum of Arts. The two largest employers are the Jet Propulsion Laboratory and the California Institute of Technology. Here, the median rent is $1494 per month and the median home value is $689,700. The median income is $76,264. Crime in Pasadena averages 16% lower than the rest of California and is 10% lower than the national average. The quality of education varies significantly with South Pasadena schools rated in the 10’s according to greatschools.org, and ratings of 3 – 6 in another area of Pasadena. If you’ll be commuting to work, the Gold Line Light Rail connects Pasadena with Los Angeles Union Station, giving easy access to just about any location in the greater Los Angeles area. A thriving restored old town bustles with boutiques, restaurants, cafes, and breweries. The famous New Year’s Day Tournament of Roses Parade, world-class museums, lovely old neighborhoods with restored craftsman homes, plus proximity to Los Angeles make Pasadena attractive to many people looking for a gracious southern California lifestyle. You can join locals living the California dream if you move to Manhattan Beach, a relaxed coastal town right on the Pacific Ocean. With 35,000 residents, Manhattan Beach has excellent schools, medical facilities, recreational activities, parks, and an array of restaurants. Los Angeles International airport is just three miles north of town, so access to the world is easy for continental and international travelers. Even though top employers in the city are Northrop Grumman, Target Corporation, Sketchers USA, Inc, and Fry’s Electronics, Inc, many residents commute to work because Los Angeles, merely 20 miles north, offers endless employment opportunities. Manhattan Beach offers a top-notch education. Schools throughout the city rate 9 and 10 out of 10 according to greatschools.org. A robust Neighborhood Watch program works at keeping citizens safe. Violent crime in Manhattan Beach is much lower than California’s average while property crime levels equal California’s average. 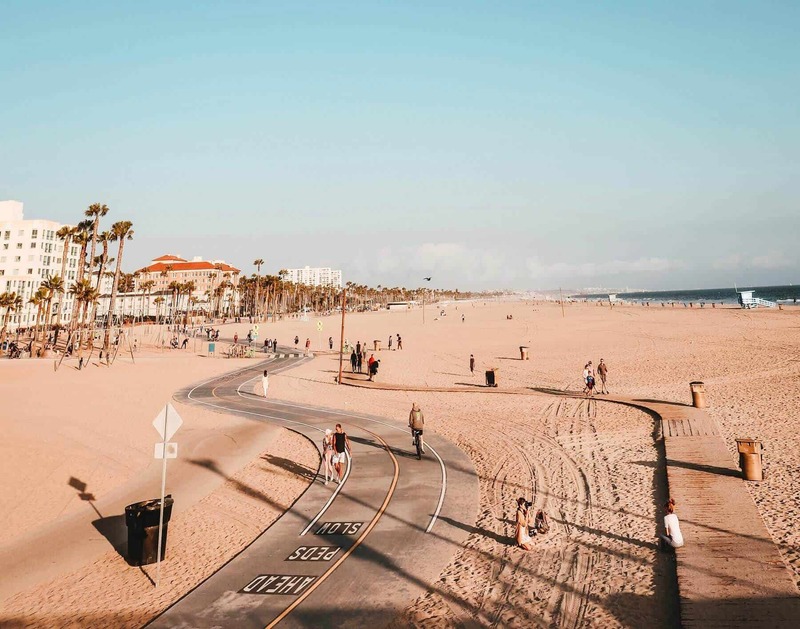 Most people move to Manhattan Beach for the quality of life and the laidback beach lifestyle where they can swim, surf, bike, jog, and stroll. Beach breezes waft clean, smog-free air across town and pleasant average summer temperatures hover in the 70s with winter temps of about 55°. Ranked 11th in the state for education, health, and safety, Poway is an appealing suburb strategically located in northeast San Diego County. The Poway Business Park is a 700-acre complex that offers tenants a variety of amenities within a high-quality infrastructure. This complex is one of the biggest reasons Poway ranks as the 6th best city in California to locate a business. Sysco Foods, Geico Direct Insurance, and First American Credco Corporation are all headquartered in this business park. Poway is a growing town of 50,200 people with great employment options and a low crime rate that’s 54% lower than the national average. The 11 schools within the Poway Unified School District are rated 7-9 out of 10 by greatschools.org. You’ll find a median household income of $98,859 and a median home price of $717,500, with most residents owning their own homes. Known as “The City in the Country,” Poway has preserved over half its 39.4 square mile area as dedicated open space. A mild year-round climate will allow you to enjoy all that open space in one of the most geographically diverse counties in the country. Family-centered events happen throughout the year with Summer Concerts in the Park, Christmas in the Park, and the Old Fashioned 4th of July. Recognized for its high-tech businesses, San Jose is ranked the 20th best place to live in the nation. With a population of over 1 million, it’s the third largest city in California. Cisco Systems, IBM, eBay, and Adobe Systems, Inc. are among the top employers. Here, you’ll love the mild, sunny climate and be amazed at the variety of things to see and do. Bike and hike the Guadalupe River Trail, horseback ride and hike in Alum Rock Park, then cool off at Raging Waters. Your family can explore California’s Great America theme park, the Children’s Discovery Museum, and the Tech Museum with IMAX theater. Your children will receive a quality education — Greatschools.Org rates San Jose schools at 9 and 10 out of 10. At 3% lower than California’s average, the crime rate varies considerably within the city. San Jose’s median household income is $84,647 with a median home price of $970,000 and is considered one of the nation’s hottest housing markets. A leader in sustainable development, “The Green Vision” focuses on clean tech jobs, recycling and reuse of 100% of the city’s water, becoming a zero-waste community, diverting waste to energy, cutting electricity use by half, and moving toward 100% renewable energy by 2025. Because coastal real estate is pricey, many people are attracted to the inland areas of California. Some lovely towns east of Sacramento are popular not only for their excellent schools and amenities, but for their proximity to weekend getaways in Lake Tahoe, San Francisco, and Napa Valley. Twenty-three miles east of Sacramento, Folsom was rated the top city in California to raise a family by wallethub.com. With a population of 74,960 people, the median household income is $102,692. The median rent is $1465, and the median home price is $433,300. Here, you can find technology jobs at Intel and Micron Technology, plus the California State Prison and Folsom Prison are also top employers. Speaking of prisons, Johnny Cash put Folsom Prison on the map with his famous signature song, ‘Folsom Prison Blues.’ Is it any wonder the Folsom crime rate is 44% lower than California’s average? Families love Folsom because 12 of the 15 public schools rate as 8, 9, or 10 out of 10 according to greatschools.org. From museums to outdoor activities, Folsom has something for everyone. Hop on your bike and explore over 50 miles of paved trails that wind along beautiful creeks, woodlands, and open space. Explore Folsom’s rich gold rush history at the Folsom Historical Museum. Enjoy al fresco dining in the historic district; music, dance, and theater at the Harris Center for the Arts; and outdoor activities at the Folsom Lake State Recreation Area. As soon as you know California is in your future, plan to stay organized as your moving date gets closer and closer. This count-down checklist will help make your New Jersey to California move go smoothly. List everything you need to do until moving day. Divvy up the work. Specify certain jobs for each family member. Post the list where everyone can see it. Keep all moving related bills and receipts in your folder. Use our Get Quote form then schedule your in-home estimates. You don’t need to worry if your mover is properly insured and licensed for your move to California. We only partner with experienced, reputable, licensed, and insured long-distance movers. Read your contract carefully before signing. Make sure you understand everything from insurance coverage and weight charges to labor costs. Plan well ahead to select the right schools for your kids. com is a terrific resource to check out the best-rated schools in your new California neighborhood. As soon as you’ve decided on schools, request transcripts to be sent to the new schools. If you are flying to California, book your flight now. Long distance move costs depend on the weight of your possessions. Start getting rid of things you won’t need like heavy winter gear and your snow blower. Make sure everything you plan to move will fit in your new California home. Do you love your 8’ dining table but realize that it’s too huge for your new dining room? Don’t spend money moving it from New Jersey to California – sell it on Craigslist.com or consign it. Set a date for your garage sale. You’ll save money by reducing the weight of your belongings plus make a few dollars at the same time. Win-win! Set a date to take things to the consignment store. Your movers will inventory everything for a comprehensive move. For partial or DIY moves, create an inventory of your belongings for backup if anything gets lost or damaged. Take photos of valuable items. Collect all your packing materials. You’ll need clean lidded boxes, packing paper, bubble wrap, tape, and permanent markers. If you’re making a partial or DIY move, the packing chore will be a lot easier if you pack a little every day. Get your vehicles serviced and ready for their trek across the country. Even if you’re shipping your vehicle, you should have it serviced before it goes on the truck. Start gobbling up all the food from your refrigerator, freezer, cupboards, and pantry. Use or properly dispose of items the moving van won’t transport such as aerosol cans, paint, solvents, corrosives, flammables, and poisons. If you’re driving to California, plan your route. You’ll need to meet the moving truck at your new California residence, so plan to stay in touch with your moving company. Change your address with Social Security, the IRS, banks, credit card companies, loan providers, and your credit union. Establish your new bank; order checks. As soon as you know your new California address, change your address online at usps.com. Ask your California real estate agent for names and addresses of utility companies that service your new neighborhood. Start scheduling installation of your California utilities, including electricity, gas, trash/recycling, internet, and cable TV/phone bundles. Cancel your New Jersey utility services. Be sure to check with your realtor or rental agent about utility service transition for the new homeowners or renters. Make sure you have all your pet’s veterinary records and medications, then put them in your ‘essentials’ box. Return things borrowed from family and friends. Start researching doctors, dentist, and vet in your California neighborhood. Your California real estate agent can help you with lists of professionals. Gather all your medical, dental, and optical records to hand over to your new providers. Start putting essentials in a dedicated box that you’ll keep with you during your move. Medical records and prescription medications. Your moving folder with inventory. Notify your auto insurance agent of your new California address. Fill your prescriptions so you won’t have to refill RX bottles during your move. Play dates or a babysitter for moving day. A friend to watch your pets on moving day. Time to tell family and friends goodbye; give them your new contact information. Transfer your renters or homeowners’ insurance to your new address. Clean out your bank safety deposit box. Have enough cash on hand to tip your movers. Clean your home or apartment, so it’s ready for the new residents. Check the forecast. Will it be raining or snowing on moving day? If so, have a supply of rags and paper towels available to mop up mud or water. Finish up your last laundry loads. Then remove hoses and drain water. Once your fridge and freezer are empty, unplug them and clean out moisture to prevent mold. Call your moving company to verify the time your movers will arrive on moving day. Be ready! Your movers will appreciate drinking water and some fruit or breakfast pastries. They’ll be working hard all day, so a thoughtful snack will go a long way in helping them get off to a successful start. We wish you all the best in your new California home! For free cross-country moving quotes, contact Great Guys Long Distance Movers, your source for licensed, long distance moving companies.